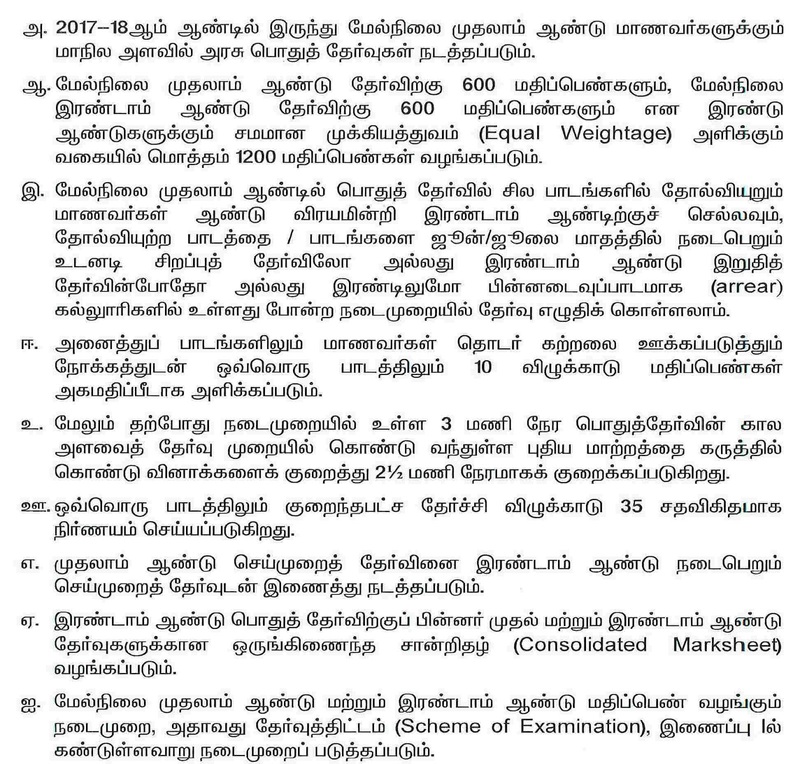 Tamilnadu plus one students need to know the mark weightage and exam pattern for their public examination. To get good marks, you should aware of changes in samacheer kalvi 11th standard board exam such as exam timing, total & subject wise marks, new syllabus, blueprint, theory & practical marks, etc. We provide all the important information about Tamilnadu 11th exam pattern which you should know before going to write board examination. 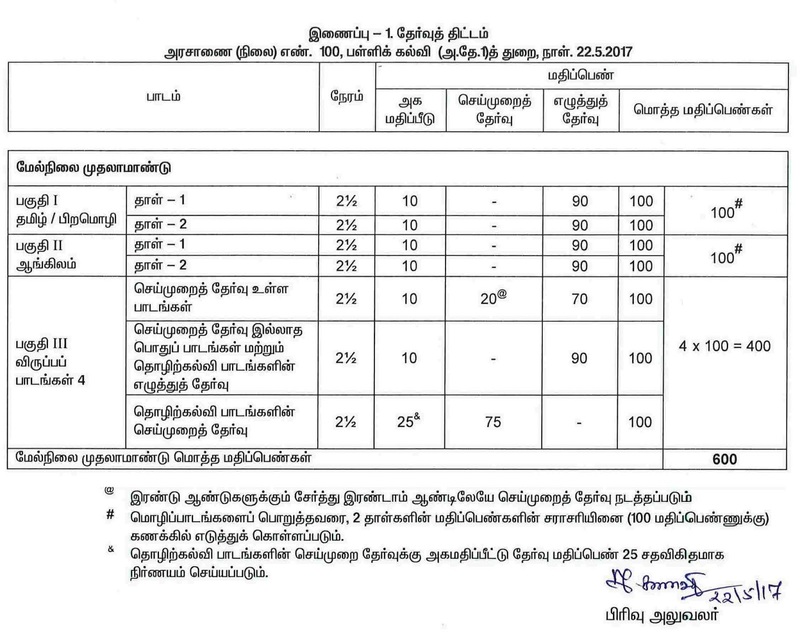 The Tamil Nadu State Government has issued an order for higher secondary first year state board public examination. 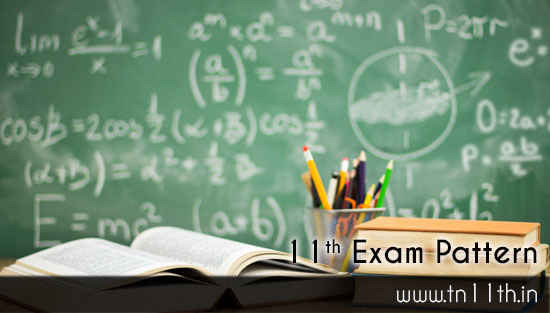 As per the new order, TN DGE (Directorate of Government examinations) should conduct common public exam for 11th standard. HSC I year common public exam should be conducted from 2019 academic year. And also the TNDGE has changed the exam pattern, marks for each subjects (practical & theory), mark weightage and total marks. Equal weightage will be given for both HSC first year (+1) exam 600 marks and HSC second year exam 600 marks. Totally 1200 marks for two years. To encourage student’s continuous learning, 10% aural & oral marks will be given for all subjects. Exam timing will be reduced from 3 hours to 2.30 hours. Number of questions also will be reduced significantly. Minimum pass mark for each subject is 35%. Even if students fail in 11th public exam, students could move on to 12th standard without wasting a year and those students should write attempt exam or special supplementary exam which should be conducted in the month of June / July. Those who can’t success in attempt exam also have a chance to clear the failed subjects during the time of 12th annual exam. Students who fail in both classes (11th and 12th) can write arrear exam like college. HSC first year practical exams will be conducted along with second year practical exam. Consolidate Marksheet for both plus 1 and plus 2 will be given after the completion of 12th annual public examination.